When you invite friends and family for a barbecue you want to cook the best food possible. At the heart of ensuring your steaks, chicken, and ribs, are cooked to perfection is your grill, which can be the difference between a hit BBQ or a phone call to the local takeaway for a delivery. Forget that call and consider cooking with the Camp Chef Woodwind Pellet Grill with Sear Box, which lets you roast, bake, grill, smoke, braise, and sear to perfection. But it also has lots more to offer as you are about to find out. This is a wood pellet-fueled grill which is used to cook meat, poultry, fish, and vegetables for BBQs and outdoor parties. It is housed on a wheeled cart, and the component parts are a pellet hopper, main grill, and a side searing box which is fueled by propane. Its primary mission is to cook BBQ food with traditional wood infused flavors, but it has controls make it easier to control temperatures and cooking times than normal wood smoke grills. A basic version which does not have the sear box is available. This product is ideal for BBQ enthusiasts who love to offer their guests food which has a real smoky taste and flavor. However, to achieve this it is often the case that while your food is cooking you must constantly stand over it in case flames get too high and the food gets badly scorched, overcooked, or burned completely. This is not the case with this Camp Chef grill as it has an electronic control panel with which you can regulate the cooking temperatures so that food is cooked at just the right speed. There is also a meat temperature probe which means, to make sure everything is going to plan, all you need to do is take an occasional look at the LED readout. 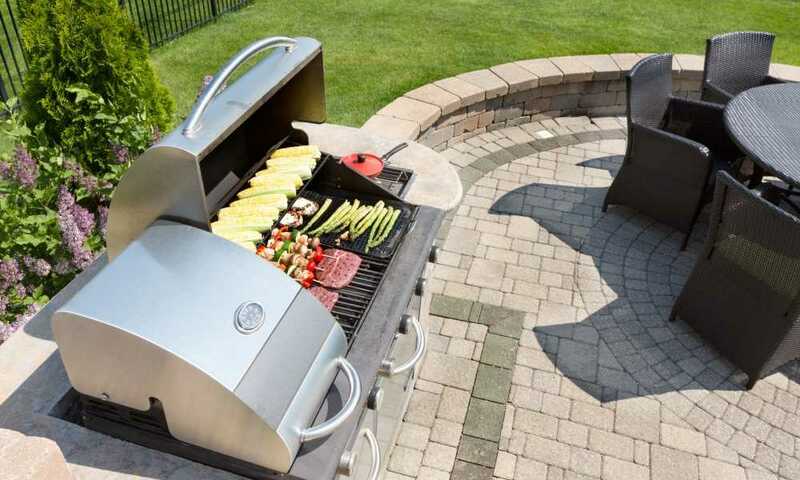 So, if you are a host who likes to entertain your guests while the BBQ food is cooking away at the same time then this grill is perfect for you. It also very simple to operate so beginner BBQ chefs will enjoy cooking with this too. It has auto-start ignition so getting the cooking process underway won’t be a problem and the control dial means you can set the grill to easily cook whatever is on the menu. Those of you that hate the messy grill cleanup after a BBQ will be pleased to know there is a patented ash cleanout system which means getting rid of the ash is a simple matter of pulling a lever. This Camp Chef grill does require some assembly, in terms of attaching the legs, side shelf, lid handle and chimney. You should find it relatively straightforward, especially as a fully illustrated assembly instruction manual is provided. Once assembled it is a freestanding cart-type grill, and thanks to wheels, you can easily move the grill to wherever you want it stored when not in use, or to the best location for the days when you are cooking with it. A point of note is that the ignition and controls are electric so wherever you plan to use the grill there will need to be an electrical supply located nearby. If none is available, you will need to run an extension lead from an electrical socket in your home or garage. One accessory which most BBQ cooks like to have is a warming rack so that they can keep food warm until it is ready to be put on their guests’ plates. Thankfully, the Woodwind grill comes supplied with a warming rack which measures 24 inches by 6 inches so there’s room on it for plenty of food waiting to be served up. If the rack is not required, it can easily be removed. While you are grilling meat, it is great if you can take the guesswork out of getting everything cooked to perfection, especially when it comes to cooking steaks. With the supplied meat temperature probe, you can do just that so that whether you are cooking a steak to medium rare, or well done, you are able to check it as you cook it. The meat probe also prevents you from overcooking other food, which causes it to dry out, or worse, you end up burning it. The sear grill is powered by propane which obviously isn’t supplied; however, there is a propane tank holder, where you can keep the gas canister out of view and safely concealed. No doubt you have plenty of barbecue and grill recipes either to memory or in your recipe books, but if you need more ideas then the supplied recipe pamphlet will hopefully give you some new ones. As mentioned above, your Camp Chef Woodwind Grillwill need to be assembled when it arrives, but this should not prove to be difficult. Once assembled it can be wheeled to whatever position you wish it to stand, thanks to the wheels which are located on each leg of the grill. One helpful feature here is that two of the wheels are castor type rather than fixed making it much easier to maneuver and steer the grill into position, especially if the route there has a few turns and bends. Regardless of where you locate your grill, it is going to encounter liquids, be that from rain, dew, or from drinks and sauces being used near the grill. Any worries about rust can be allayed as the materials used throughout the grill are either stainless steel or porcelain-coated steel which should prevent any corrosion. When it comes time to cook your first steaks or burgers, you will obviously need to add fuel pellets. The fuel hopper is located to the left and can hold up to 18lbs. of pellets so it shouldn’t need refilling too often. Filling it up to start with is a simple matter of opening the lid and pouring the wood pellets to the top. Jumping ahead somewhat, once you have finished cooking, there can be the issue of unused pellets and the difficulty in removing them. Thankfully, this grill has a pellet drain chute which means you can remove the unused pellets and store them. This can also be used to swap out for a different type of wood pellet which can be the case when cooking various types of food. One issue we did notice is that the control knob for releasing unused pellets cannot be locked so there is a chance that if it is accidentally knocked against the pellets could end up emptying onto the ground. With the grill all set up, plugged into an electrical source, and your fuel in place, all you need to do now is ignite it, which is done via the control panel. This panel allows you to adjust the temperature of your grill to around a dozen different settings, from a low smoke, all the way to the high setting which can provide a temperature of around 500° F.
This panel also houses the socket for you to plug in the supplied meat temperature probe which is a huge aid to you being able to cook all your meats to perfection. The temperature can be clearly seen on the large LCD display which is also on the control panel. The main grill area measures 19.5″ by 22″ so at the heart of your cooking area there is plenty of room for you to cook several different foods. In addition to this, there is a smoking/warming rack which adds a further 6″ by 24″ so in total you have a mammoth 570 square inches of cooking racks, so you can cater for even the biggest of family gatherings. The warming rack is a great addition as it lets you keep food which has been cooked warm, while you continue cooking on the main grill. Then, when all is ready you can serve it up together rather than bit by bit, which may be ok to some, but means your guests are all eating at different times. To the right of the main grill, you have the sear grill, which comes with enamel coated iron grates. It has its own ignition system and is powered by a propane burner. For safety reasons propane is not supplied with the grill, but once you have bought some, the tank can be housed underneath the grill, and out of sight. The sear grill is used to create caramelized crusts on meats such as steaks or sausages, for poultry and for fish too. To sear properly very high temperatures are required and with this sear grill capable of up to 900° F you will have no difficulty in doing so. It is also fun to use the sear grill to create the crosshatch marks which make every piece of BBQ look that extra bit more appetizing. The size of the sear grill is 11.5″ by 16″ which adds a further 184 sq. inches to your grilling surface area. This is important because in addition to its searing functions it can also be used at lower temperatures to cook food via diffuser plates, to supplement the main grill cooking area. As searing can generate a lot of grease from the meat which is being seared, it is helpful that the sear grill has a grease management system, which allows grease to flow into the drip tray underneath. Regarding waste disposal, at the end of your barbecue, there is always the issue of the ash which has been created by burning the wood pellets. The beauty of this Camp Chef grill is that it has a patented ash clear-out system which allows you to open the door underneath where the ash falls into a collection pot for disposal. This means you no longer have the hassle of removing grill grates and drip pans to get to the ash. The installation process is relatively straightforward and starts by inserting the four legs and tightening the securing bolts. Next, you place the bottom shelf in position between the four legs and tighten the bolts for it. The chimney and chimney cap are bolted in position at the rear of the grill, although it should be noted that the height of the cap should be adjusted depending on the season. In summer the gap should be 1-1.5 inches and during winter months it should only be 1/2 inch. This helps control the heat within the grill when the lid is closed and keeps the wind from getting in and lowering temperatures. The last part that needs to be installed with the use of hardware is the grill lid handle which is secured to the top of the lid with two simple screws. Other parts that need to be placed in position are the cooking grate, the warming rack, and the defector and drip tray, inside the main grill. You also need to place the ash cup underneath the grill, and finally, you can plug in the meat probe, although this can be done on cooking days if you prefer. It may be that you are not particularly bothered about having the ability to sear your food and would prefer that extra cooking capacity on your main grill. 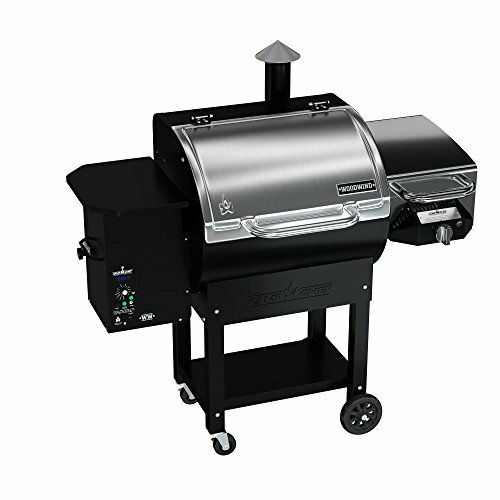 In that case, you could consider the Pit Boss 72700S Pellet Grill which has 700 sq. inches of cooking area on its main grill compared to the 429 sq. inches which the Camp Chef grill gives you. Another feature that many BBQ enthusiasts look for is a decent amount of storage space on their grill. Although the Camp Chef grill has a shelf underneath, anything placed there can be easily knocked over. If you prefer a more secure storage area with doors to keep all your tools and sauces safe and out of view, then the Z Grills Wood Pellet Grill & Smoker is a great option. With its distinctive black and bronze design, it also looks great too. The Camp Chef Woodwind Pellet Grill with Sear Box is a barbecue grill which will satisfy those who have never cooked on an outside grill before and those who consider themselves a seasoned pro. It is simple to set up and get started and thanks to its electronic control panel in conjunction with the meat probe, you can keep on top of your cooking times and temperatures to ensure everything is cooked to perfection. With a sear unit to caramelize and cross-mark your steaks, sausages, and burgers, not only will everything have that distinct smoky flavor that only a wood-fueled grill can give you, it will look amazing too. A patented ash cleanout system means once all the food has been cooked, you don’t have the hassle of clearing ash from the grill but instead you can join your guests and enjoy the party.